Hundreds of people in Houston’s Latino business community gathered Thursday night for the Houston Hispanic Chamber of Commerce’s “State of Hispanics” event, listening to speakers make the case that businesses — particularly in Houston — need to integrate a growing and well-qualified pool of Hispanic candidates into their workforces and leadership. Hispanics will become Houston’s largest ethnic group by 2020 and represent more than 25 percent of all spending in the region. The demographic group’s spending in Houston could top $80 billion by 2022, up from $55 billion today, according to the Houston Hispanic Chamber of Commerce. Businesses are finally starting to take notice, said Laura Murillo, the president and CEO of the chamber, although she noted the conversation is “long overdue.” The chamber has grown as companies seek to connect with the Hispanic community. New members to the chamber include IBM, Citgo Petroleum, and the U.S. Army. “This is a market that one must look at if you’re going to succeed,” Murillo said. About 2.7 million Hispanics live in the Houston metro area, according to projections by the Texas Demographic Center, the state’s liaison office to the U.S. Census Bureau. Hispanics could be the largest demographic group in the state as early as 2020. Much of this growth will come from people moving here from other states, such as California, Louisiana and New York. “The purchasing power of Hispanics in Houston is huge,” said Pablo Pinto, the director of the Center for Public Policy at the University of Houston. Murillo said businesses in Houston could miss opportunities to tap into this market if they don’t consider Houston’s changing demographics as they make decisions about hiring, promotions and leadership within their own companies. Only 13 of the 275 people who hold board of director positions in a Fortune 500 company based in Houston are Hispanic, according to research presented by the Houston Hispanic Chamber of Commerce. 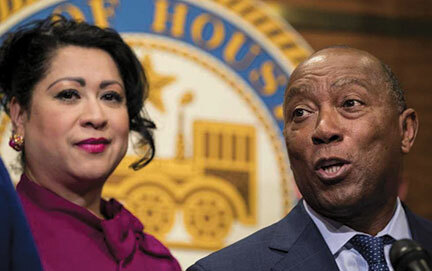 That represents just 5 percent of the board seats, even though Hispanics make up 40 percent of Houston’s population. “You have to pay at a high level to get those people, so it’s expensive,” Gacita said.